I am happy to announce (probably not as happy as you), that you will no longer have to hear me whine about our horrible weather. What was seemingly an infinite winter, has finally disappeared to wherever winter goes and spring has arrived. We spent the day enjoying every bit of the weather we could with a picnic at our favorite park and a nice walk with the dogs. It was so wonderful to soak up that sun and feel the warm breeze! And I can’t tell you how thrilled I was to hear that tomorrow is even supposed to be better than today! Because we can finally see a light at the end of the winter tunnel, it won’t be a big deal if we get a little more rain here and there. The hope of sunny days ahead and the taste of today and tomorrow will tide us over, and in a couple of weeks I’ll be planting herbs on the deck and filling pots with flowers. Before we know it, we’ll be relaxing in lawn chairs, sipping cocktails in the backyard, and watching the sun set – one of our favorite weekend evening past times. In honor of spring’s arrival today, I made us a lovely dinner full of spring colors. Did I also mention it was simple? Incredibly simple, fresh, and delicious. Perfect for the day after all of that Easter indulgence. Slice the bread and place on a baking sheet. Broil until toasted. 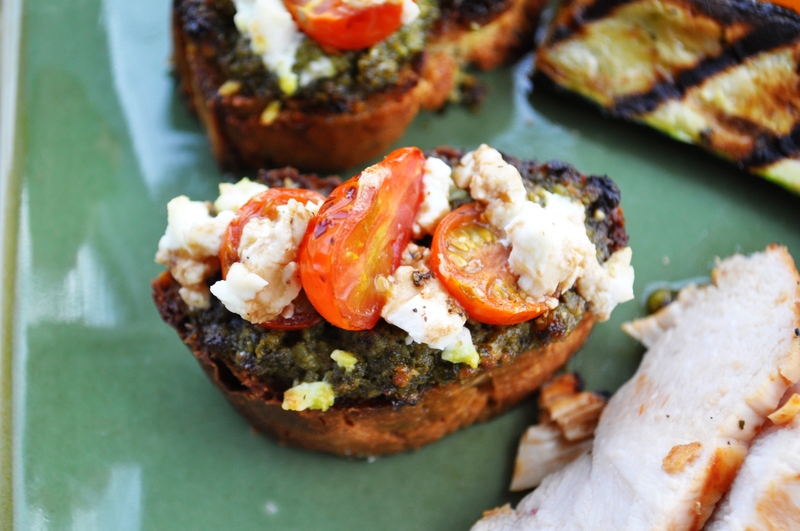 Spoon about 1 Tablespoon of pesto on each piece of bread. Slice tomatoes in half and distribute evenly. Crumble sheep’s milk cheese evenly. Grind pepper on each piece and drizzle with olive oil. 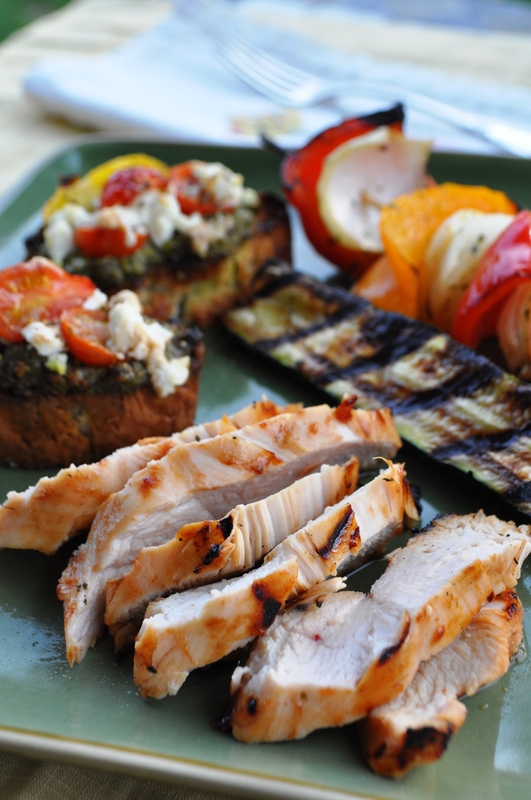 Place under broiler when vegetables are placed on grill. Remove when tomatoes are softened and cheese begins to bubble and brown. Drizzle with balsamic vinegar. Cut peppers and onions into large chunks and place in medium bowl. Remove ends of zucchini, slice lengthwise and add to bowl. Drizzle with olive oil, sprinkle with salt, garlic powder and dried parsley, toss until thoroughly coated. Add to medium-high grill about 6 minutes after the chicken has been added. Add the zucchini a few minutes after the peppers and onions have been on the grill. It cooks very quickly. Rinse and dry chicken breasts and place in a medium bowl. Drizzle with about 1/4 cup BBQ sauce and 1/4 cup rice vinegar. Stir to coat. Marinate for 20 minutes. Place on medium-high grill 6 minutes before adding the vegetables to the grill. That’s right, I had forgotten that your seasons are opposite ours. If I had to endure another winter right now…yikes, I wouldn’t make it! Have a wonderful week April! You certainly do know how to celebrate Spring’s arrival! Everything sounds so delicious, although I have to admit being partial to bruschette. Your have such a great mix of flavors and must’ve been tasty. I am missing a summer which never existed and heading into an antarctic winter! Oh.. I’m sooo glad! 🙂 Happy Day!